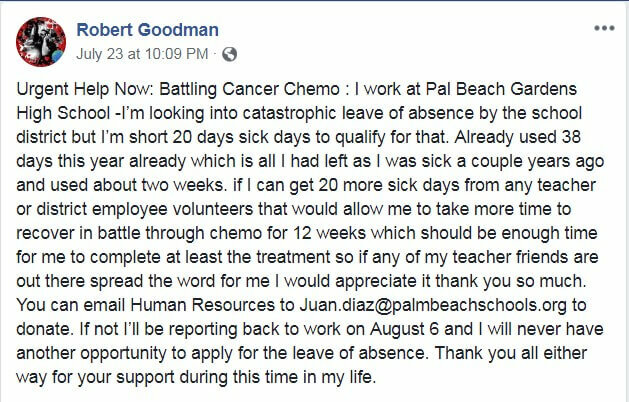 The Florida public school teacher Robert Goodman was diagnosed with colon cancer and spent all his paid sick days fighting the disease. Upon undergoing surgery and chemotherapy, Robert still needed at least 20 extra sick days to survive one more round of treatment. Alas, he didn’t have the luxury of a paid sick leave anymore. The thing Goodman’s colleagues did for him is TRULY amazing! Previously, the Typical Student team told you about 7 HEARTWARMING Times Complete Strangers Helped Struggling Students. Now, it’s time for another piece of kindness! Why Did US Educators Donate Their Paid Sick Days to Robert? As told by CNN, on July 23, Robert Goodman took to Facebook to ask for help. He posted a selfie he had taken in a room at Tomsich Health and Medical Center of Palm Beach County. In mere days, he got an extra pack of sick days to “cover an entire semester.” How did that happen? "Educators all over the country were reaching out to me to donate their sick days, even professors over at Florida Atlantic University!" "I felt guilty because I knew there were people who had it much worse than me." As reported by CNN, Robert Goodman has been a history teacher at Palm Beach Gardens Community High School for 23 years. In April, he learned he had stage III colon cancer and felt terrified. Sharing his diagnosis on Facebook felt liberating, for he wanted to tell people who faced cancer that they’re not alone. Robert said he wasn’t surprised with how much kindness his fellow educators have shown him, for “when one of their own needs help they'll always step up.” Also, there has been lots of support from students. Classes at Palm Beach Gardens Community School started on August 13, but Goodman isn’t there as he continues fighting his disease. Dubbed "teacher by day, singer-songwriter by life" Robert is currently writing songs “to inspire more good in humanity.” Let’s wish Robert the best of luck and the soonest recovery!